Bollywood actress Kriti Sanon asked fans to pray for her ahead of her Koffee With Karan show. Bollywood actress Kriti Sanon asked fans to pray for her ahead of her Koffee With Karan show. 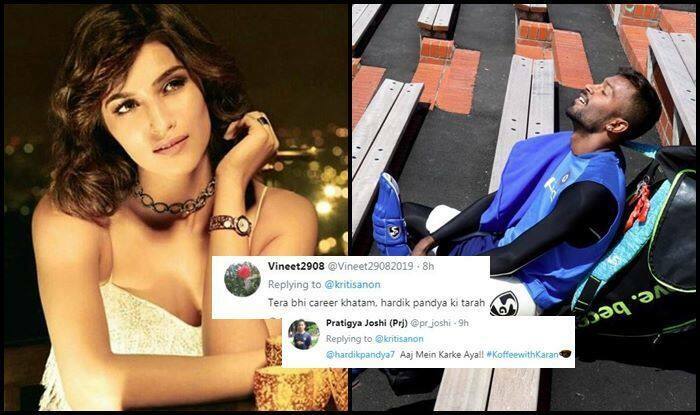 Fans went on to remind the actress of India cricketer Hardik Pandya, who got in trouble recently after his episode was aired. Pandya’s misogynistic comments got him into trouble and was suspended from the team. He had to fly back to India and could not feature in the initial stage of the limited overs series. The suspension was lifted and he was brought straight back into the side. Fans are a little worried about the Bollywood actress and hence are reminding her of the Pandya episode and asked her to be careful of Karan Johar’s questions. Some fans also went onto the extent of feeling it could be the end of her career. Here is how fans reacted. Currently, Pandya is in Hamilton for the 3rd T20I. Meanwhile, India will look to carry the momentum they gained at Auckland in Hamilton. In a season of many firsts for the Indian cricket team, Rohit Sharma’s men will be aiming to become first among the equals to win a T20 International series in New Zealand when the two sides clash in the final match on Sunday. The past three months have made for a memorable phase for the Indian cricket team, which won its first Test and bilateral ODI series in Australia followed by the biggest one-day series win in New Zealand. A first T20 series victory in New Zealand will be the icing on the cake for the ‘Men in Blue’, who have far exceeded expectations during their three-month sojourn in this part of the world. With the series locked at 1-1, there is everything to play for in the decider which promises to be a cracker of a contest on a ‘Super Sunday’ with a spicy Seddon Park pitch in the offing.